The Retail Expert's BLOG: From the country that brought you slow food…slow retail? From the country that brought you slow food…slow retail? During our recent trip to Italy, we stumbled across a retail marketing idea that really made us think. And, given the current retail climate, any retail promotional idea deserves an opportunity. Italy brought us the slow food movement, rebelling against fast food. While it has been slow in building in the U.S. (Alice Waters of Chez Panisse is a big proponent), it does seem to be picking up steam. So, if we have slow food what about slow retail? The more time you spend in the store, the more money you save. Spend 10 minutes in the store and get 10% off. Twenty minutes, 20% off and 30 minutes, 30% off. Data suggests that there is a correlation between time spent in retail stores and money spent. The more time, the more money. Given the promotional thrust of most retailing today, it may just be another, more creative way to market a discount. But (and a giant one…), that time needs to be productive time for the customer. If it is time spent finding a parking space, finding an item or waiting in line to check-out, it can quickly become a negative. As creative promotions go, this one makes you think. Besides the logistical difficulties of actually tracking time spent, there is something compelling about a retailer who encourages customers to really understand their offer. In the case of Freddy, this really does seem to make sense. We would kind of liken them to the Lululemon of Italy. They specialize in what they call the art of movement, creating stylish clothing for yoga, ballet and active pursuits. They were the official sponsor of the Italian Olympic team in Beijing as well as the upcoming Vancouver winter Olympics. Like Lululemon, it does take more time to explain technical product and there is a passion for what they sell that does encourage more time spent in the store. 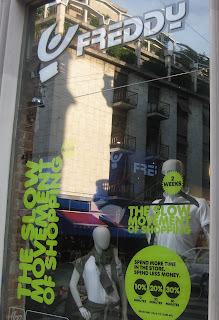 How slow retailing gets balanced against our fast-paced lifestyles is the real challenge. Our research indicates that customers have been shopping less stores and spending less time while shopping. But, there are certainly experiential retailers that would seem to buck the trend. What’s your point of view? Besides the inevitable slew of Italian jokes—and yes, we can attest that it almost impossible to get anything done in Italy in less than 30 minutes…is there merit in encouraging customers to spend more time in the stores? Interesting. As the lead character in "Spinal Tap" so famously advised, there's a fine line between clever and stupid. It's a good idea if it works to attract traffic that may not have normally made a stop, if it stimulates browsing that translates to added sales, and if it gains PR points for its wackiness. But.....it's stupid if -- as I suspect -- it's just an easily gamed promotion. The only way to find out is to go in and measure the effect. Often, it's the response to the bad idea that sparks a breakthrough. For a certain type of retailer, and Freddy qualifies, a quality interaction really could lead to more sales. Training the sales staff to engage, find a consumer's interest, talk up the features of a favorite product, etc...creates the experience. At Lululemon, the are so enthusiastic about what they're doing that customers willingly get caught up in the experience (and probably buy more). This can happen without the gimmick of "slow retail" but that mechanism certainly comes the attenton getter. Garbage! Retail is detail. I have been in the retail business for over 20 years, and just to make things relevant, going after a 'Social Media' degree from UCLA. I see Freddy as someone behind the times. And for that matter, myopic in perspective to the economy and to consumer responsibility/values. Difficult as it may seem to critique a European retailer versus US is hardly fair, considering that I have never been in a "Freddy", but I can throw out my two-cents worth knowing that my retail business experience is worth something. And I know that the tracking metrics are very different in comparison to the US. Suffice it to say, I dislike the "Freddy" idea. CSR, consumerism, prank-driven, call it like you want, but the idea is sophomoric. Would it not be wise to critique retailers in the US, and comment on abroad? Using this new metaphor in the context of mass merchandising and the convenience/drug sectors, the goal of great planogramming and merchandise presentation is to make the desired items immediately visible and available and hasten the shopping trip, but to make the rest of the POGs and endcap(s) and other displays enticing so that the consumer either slows down, looks, and purchases, or that they have such a vivid image of fashions or products that are interesting, might be valued, and that this sticks in their mind. Boring, same-old same-old stores, POGs, etc hurt; refreshing the in-store look on a managed time-phased basis is good for all participants in the retailing universe.